Brief Review of Pandora: The World of Avatar! 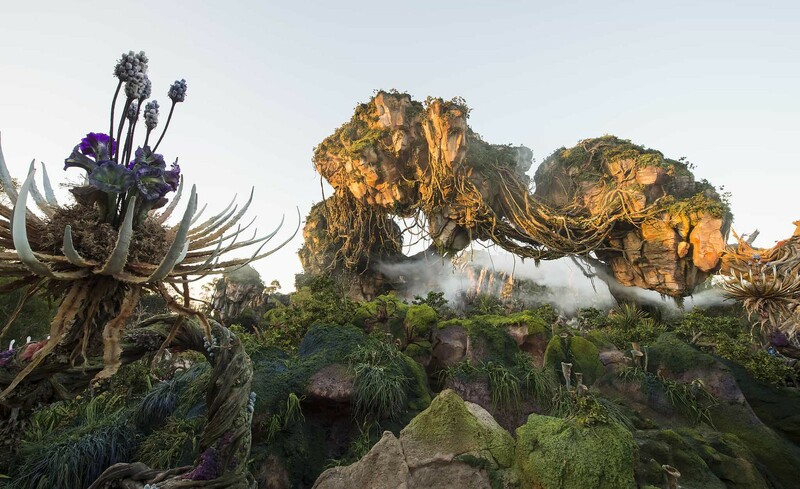 Today, we're going to share a brief review of Pandora: The World of Avatar at Disney's Animal Kingdom, that our own David Spencer was able to experience earlier this week! Greetings. I got a text Tuesday morning from my buddy who works at WDW, he had a ticket for me to go to Pandora for the Cast preview. I took lots of pictures. We rode the water ride (sort of a yawn), the Banshee ride was down when we were there. It's supposed to be Soarin' on steriods. You wear like virtual reality gogles, straped into a bike like seat and your legs are held in place too. They say there is an incredible WOW moment like only 8 seconds into the ride. I didn't want to know, so I didn't find out. I want that to be a surprise when I finally ride it. The land is well done, with a gift shop too, and the food is themed so well. The queue lines are both great. The water ride is just a like a lazy river with some great and cool effects, but it's short and just lacking some a big highlight moment, for me. There is an interesting item close to the entrance of the land: a large turkey leg looking item. They tell you to rub it to help pollinate Pandora. As you do steam comes out and then water shoots out the top - I kid you not. It's kinda odd. Stay tuned for more from Pandora: The World of Avatar!